A March Man-ness Health Event volunteer talks with one of the attendees at one of the event's information tables. March 29, 2019 | March 29, 2019 | March Man-ness met basketball March Madness on a recent Saturday morning, and Charles Smith was able to enjoy peace of mind and entertainment from both. Seated near the free throw of a basketball court in the Saint Mark Baptist Church gymnasium, Smith was relaxing and watching an NCAA Basketball Tournament game on a giant projection screen March 23 during the sixth annual March Man-ness Health Event organized by the UAMS 12th Street Center for Health & Wellness. Smith’s peace of mind came from having gone through all the health screening stations at the event. Before sitting down to watch, Smith was one of more than 31 men and women who circulated through rooms on each side of the gym at Saint Mark. 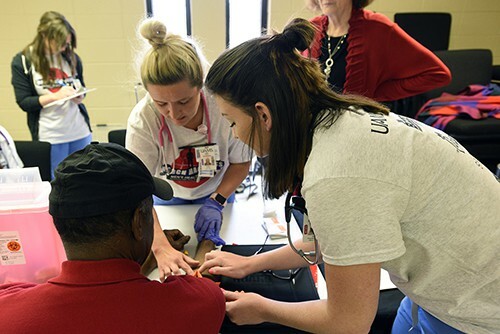 The UAMS students along with volunteers from other health organizations provided participants with free health care services, including checking blood pressure and glucose, HIV testing and physical examinations. Men also had blood drawn to check testosterone levels, cholesterol levels and prostate sensitive antigen (PSA) for prostate cancer screenings and other blood components necessary for optimal health. 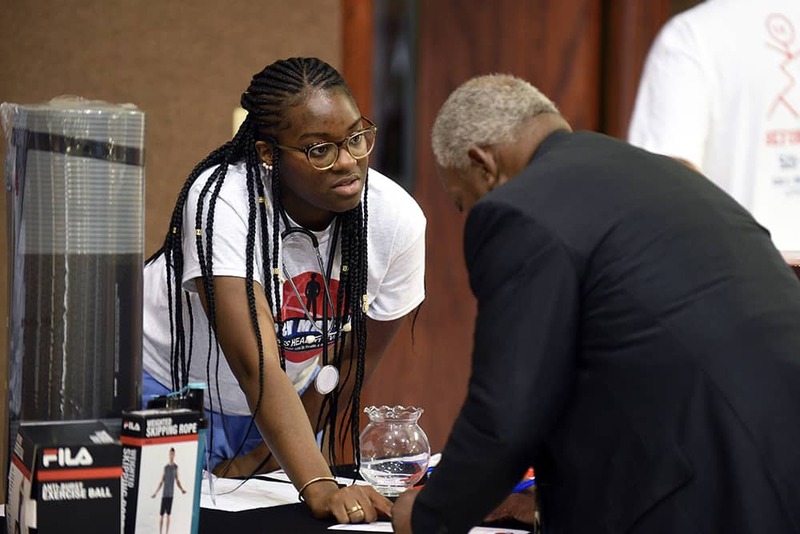 A panel of health care professionals, pharmacists and physicians along with UAMS students supervised by them were on hand to answer personal health questions. Student volunteers at the event draw blood from one of the attendees for a health screening. The crowd also seemed especially eager to get nutritional guidance, visiting with volunteers like Brianna Rhodes, Pharm.D., On Saturday, she was drawing small amounts of blood from participants to check their cholesterol levels. Rhodes is finishing a residency at UAMS in preparation for becoming a chronic disease state management clinical pharmacist, working with physicians to help their patients get better control of conditions like diabetes and high-blood pressure. Rhodes also works as a preceptor, instructing and supervising pharmacy students as they perform health screenings and patient counseling. Melissa Clark, Pharm.D., M.P.H., director of the 12th Street Center, said that from the very start, Saint Mark also has been a key partner in the success of March Man-ness, providing the venue as well as helping with outreach. Free food, T-shirts, educational materials, child care and activities were provided at March Man-ness. Saint Mark is the main sponsor and has been since this UAMS event began in 2014. Additional sponsors are the Arkansas Minority Health Commission and JM Bozeman Enterprises. ARCare, Arkansas Prostate Cancer Foundation and the Arkansas Cancer Coalition are providing supplies and services for March Man-ness.